If religious passions are inflamed, it is election time. This is what every regular visitor to India has come to know. 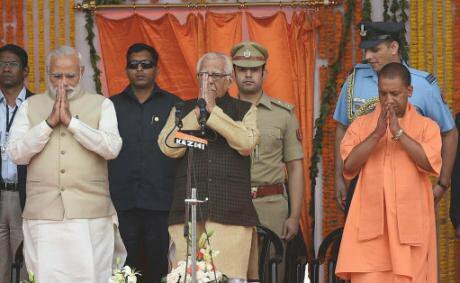 Narendra Modi (left), Governor of Uttar Pradesh and newly appointed Chief Minister of Uttar Pradesh Yogi Adityanath (right) greet the crowd during Yogi Adityanath's swearing-in ceremony in Lucknow, Uttar Pradesh on March 19, 2017. Xinhua/Press Association. All rights reserved.India is a happening place. It has just witnessed the rare event of a Hindu priest becoming the Chief Minister of its politically most influential state of Uttar Pradesh (U. P.). Ajay Singh Bisht became Yogi Adityanath and after the death of his “spiritual father” became the head of his religious establishment. Prime Minister Narendra Modi campaigned hard to win the state assembly elections for his party and then ensured that the state is ruled by a monk in saffron clothes who converts Christians to Hinduism and delivers anti-Muslim speeches. In the ancient Hindu tradition, the priests preached and the rulers ruled. The division of labour is clearly marked; based on the accident of birth or by the virtue of the person’s conduct. The priest enjoyed a status higher than that of the king and was respected by the ruler as his Guru and adviser. But a priest would never be the king. The ancient Hindu traditions notwithstanding, Yogi Adityanath is following the footsteps of some Hindu priests who began to participate in politics in order to challenge Nehru immediately after the independence. They were upset as Nehru talked to millions of his countrymen about the need to develop a scientific temper and march towards modernity. He called dams and other development projects, temples of modern India. Nehru was the prime target of the Hindu right wing political formations that attracted many heads of the Hindu religious establishments. Of course, they could not mount a significant challenge during all these decades and no serious setback was caused to the nation’s secular ethos. The new U. P. Chief Minister who transformed himself from an ordinary mortal into a Yogi took to politics like duck to water and has been winning parliamentary elections for years. This priest’s fiery speeches and hateful rhetoric promoted the consolidation of the Hindu votes in the 2014 parliamentary elections and the latest state assembly elections. For the same reason, the new Chief Minister has caused unease among those who see this as an initial step in the grand plan for eventually turning India into a majoritarian state, called Hindu Rashtra. The Yogi’s selection also indicates that Prime Minister Modi does not want to take any risk in 2019 when he would seek a second term. He has figured out that he cannot win without the consolidation of the Hindu votes and without a promise to end the appeasement of the Muslims. Some Muslims may vote for him out of fear. His party sent a strong political message when it did not select even one Muslim candidate in the state elections. Modi’s devotees have heartily welcomed the selection of the Yogi. One commentator applauded Modi for staging the third disruptive event after the surgical strike against Pakistan and de-monetisation. A Yogi becomes a Commissar! But Hindus pray for a commissar to become a Yogi, a more evolved being. Many Hindus would say that this militant-monk, this fire-brand BJP leader who spreads hate is no Yogi. If Adityanath looks up the meanings of the Sanskrit words yoga and yogi, he would give up his divisive politics and uphold the principle of unity in diversity. Yoga signifies union, balance and moderation. In New York, “Hot Yoga” is a brand but a true Yogi cannot go about exposing himself to criminal cases and fuelling violence against a community. But all that does not matter because the Prime Minister is behind the Yogi and the media is suffused with comments applauding Modi’s astuteness. Before the state’s Chief Minister was selected, the Yogi’s followers went around shouting the slogan that those who want to live in the state must hail their Yogi! Modi saw the Yogi’s potential. This Yogi also runs a Hindu youth organisation, independent of the BJP. The Hindu card matters in elections but its effectiveness rises and falls from time to time. Even in the recent surcharged sectarian atmosphere, the BJP would not have got such an overwhelming majority had it projected this Hindu monk as the chief ministerial candidate. In his poll campaign, Modi used the themes of development and Hindutva (Hinduness) in the right proportions. Thus the selection of the monk after winning the election has been described by a commentator as “bait and switch”. Hinduism marks a clear distinction between the spiritual and temporal power. So is an ancient religion transforming contemporary politics or the ruling party’s politics modifying Hinduism? This reporter, steeped in the Hindu tradition, was horrified when first he saw the Knights of Armour glorified in Christian churches or read about a Pope of a bygone era who issued a clarion call for the destruction of the non-Christians. Of course, like the Christian churches of the yore, several Hindu temples and self-appointed Hindu saints are very wealthy, owning large sums of cash, gold and real estate. And if Great Britain learns from the largest democracy, the Conservative Party could groom the Vicar of Bray to be the next Prime Minister! But Yogi’s selection has upset some of Modi’s followers. They were mesmerised by Modi’s development dreams. Now they advise Modi to be like Nehru or at least discipline the “foul-mouthed fanatics” in his party. These innocent columnists driven by their hatred of the Congress regime never understand where Modi came from. They ignored Modi playing the religion card during his election campaign in U.P. Modi gathered more votes for his party by saying that the state government should provide equal patronage to the Hindu crematorium and Muslim grave yard. The implied political charge of Muslim appeasement against the state government was clear. They say a person charged with inciting sectarian violence and facing criminal cases ought not to have been chosen, especially since Modi had made a lot of noise about decriminalising politics. But Modi will dismiss with contempt this tiny section of his devotees displeased with him over the Yogi Adityanath affair. Their newspaper articles cannot shake Modi’s self-confidence. Hypothetically, today if Modi were to declare that in 50 days, he would make the sun rise in the west, hordes of his devotees in India, UK and America would hail him through the social media. With appropriate gestures, he might explain how this New India to be transformed by his New Politics would help the poor. Also the New Sun God would stop appeasing the people of the Eastern India, infiltrators into the sacred nation from across the border! Tweets will blame the Congress Governments of the past for obstructing the change in solar trajectory! After all, Modi is no ordinary man. He got a massive mandate by the people of India. In a democracy, that is the end of the argument. However, since arguments are still allowed in India, a Yogi becoming a ruler may lead to vigorous debate. Some Modi devotees may be looking for a verse in the sacred texts of Hinduism that sanctions the wielding of political power by a Yogi! The Hinduism texts do contain contradictory statements, leaving scope for argumentation. A Vedic hymn questions even the Divine’s ability to know everything. That would be considered heretical in some other religions. Are Hindus more spiritual than the westerners? Is the concept of monkhood different in Hinduism and Buddhism? If some Buddhist monks turned violent, why can’t the Hindu monks do the same? Why do the Jain monks refrain from hurting even the insects in the air and on the ground? Did Gandhi weaken the nation by preaching non-violence? Isn’t muscular Hinduism needed to fight the Islamic fundamentalism, as Yogi Adityanath keeps saying. The Hinduism experts have to seek answers to such questions while political analysts may tell us whether the Yogi was chosen because he belongs to a dominant caste. Could a Hindu priest belonging to the small Brahmin community have been chosen in his place? The academics joining the fray will invite hostile reaction of the kind that seeks to intimidate those historians and political scientists criticising sectarian rhetoric in India. The American scholars of Hinduism are more vulnerable as some recent events have shown. But they will be rewarded if they cite a sacred text justifying the Yogi becoming the king! The view that the Hindu tradition marks a distinction between the spiritual and temporal power will be contested through cyber posts and You Tube videos. The Hollywood Hindus have been encouraged by the resurgence of Hindu nationalism in India now ruled by the “Emperor of Hindu Hearts”. They run a rapid response team to rubbish any criticism of Modi. Even devout Hindus committed to the nation’s secular Constitution are called “sickular” and “fake Hindus”. Someone well-versed in the sacred literature of Hinduism rarely questions the political Hindus. One exception was the late Ramu Gandhi, Mahatma Gandhi’s grandson, a teacher of philosophy. After the BJP’s movement to build a temple to Lord Ram at a place where Ram was born, Ramu Gandhi said in New Delhi that as per the Hindu tradition, the place where a baby is born is considered “impure” and thus a temple cannot be built there. Ramu Gandhi’s argument did not convince the pious Hindus who demolished the mosque that was said to have been built in that place. Years ago, Ramu Gandhi got away with it, today a philosopher would hesitate to challenge a mob! The Ram Temple issue has been hibernating. With the Yogi as the Chief Minister, the BJP will push it onto the front-burner. Modi has taken off his mask, at least temporarily. In the parliamentary election in 2019, Modi wishes to use the Yogi. So religious polarisation will be a continuing crusade.